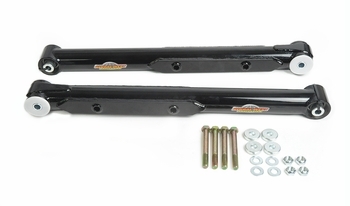 Global West Suspension manufactures tubular rear lower control arms for Chevelle, El Camino, Malibu, Monte Carlo--model years 1964, 1965, 1966, 1967, 1968, 1969, 1970, 1971, and 1972. Installing these arms will help in many different driving conditions, including controlling lateral movement, reducing wheel hop, increased corner exit, straight line stability and more. They can be used for street, drag race, road race and autocross applications. Extra spacers comes with this kit to allow proper fitment of the sway bar. We put a spherical bearing on the frame side of the control arm to make sure the twisting loads that the arm will normally would have doesn’t put the load on the bracket that comes off the frame. The bearing allows it to pivot without any resistance to keep the load off the frame mount. The spherical bearing does not require lubrication, it has a Teflon inner liner, and won’t have any noice. This lower control arm design performs flawlessly. The maintenance is low and the bushings are quiet. The rear end is stable, especially around corners. The arm allows the rear end to pivot without bind due to the bearing being installed on the frame side. Del-A-Lum bushings provide lateral control. This feature will make the car track straighter during a drag launch plus increased lateral cornering ability is achieved. The Del-A-Lum bushings have a lifetime warranty to the original purchaser. Watch the product overview videos above for more information. Global West in the Press: Check out this Car Craft Magazine article featuring the Global West Suspension G-Plus System for the 1965 El Camino.